Ran in the Provo Canyon. Warmed up, then the standard 3 mile tempo down partially for training and partially for a test of health. Managed 16:26 with the mile splits 5:36, 5:24, 5:26. HR at 160-162. Legs started failing on the last 0.5, the pace became noticably more difficult, not a good sign. Did not feel good after finished, but I've felt worse. Jogged uphill for a while at 8:00 pace, and after a while started feeling good. First thought of dowing some 100 m accelerations down. Then started feeling better, and decided to do 5x400 down in 75 each with 200 recovery. Did 74.0,74.6,75.3,73.8,70.7. Felt OK, HR climbed to 160 by the end of each repetition - this shows how anaerobic those quarters are - the heart does not have the time to respond. Ran with the kids at home. Easy 8 with Ted in the morning. Chased 7:30 guy, got him, finished in 59:12. No HR data - left The Toy unplugged. Easy run with Ted in the morning. Only 6 miles, mini-taper for the Thanksgiving 4 miler tomorrow in Orem. Chased 7:30 guy, got him shortly before 5 miles. Then part of the way into the last mile I suggested we try to break 6:00 on the last mile. We managed 5:56 with the quarters of 1:42 - 1:28 - 1:23 - 1:23. Total time 43:13. HR was better - 120 at 8:00 pace (normal), 131 at 7:10 pace (5 bpm too high), 159 at 5:32 pace (2 bpm too high, but I did not hold it for long enough to see if it would drift). The overall feeling at 5:32 pace was also better - it felt comfortably sustainable, at least during the 0.5 mile stretch. But that does not mean much - I've had days when 5:30 felt sustainable for 1.5 miles, and then all of a sudden I had to slow down to 5:45. Tomorrow I'll have a chance to measure the degree of my recovery. Ran with the kids in the late afternoon. Orem International Thanksgiving 4 miler, 21:50, 10th overall, 1st in the age division, got the turkey. "International" in the name of the race is rather an exaggeration. However, it is technically correct - sometimes people from foreign countries run in this race. This is a big family race. They have kids races for every age, and give awards to the youngest participant, the oldest participant, the biggest immediate family, and the biggest extended family. Last year Joseph won the youngest participant awards - he walked 100 meters in 4:10 pushing a toy walker. That was the only way he could cover the distances, being only 10 months old. Two years ago, they had some extra turkeys. I proposed the award to the most pregnant participant. Sarah won it, being 8 months pregnant and having finished the race in 57:00. Her closest competitor was 6 months pregnant. This particular race has been becoming more and more of a challenge over the years as the number of my children increased. It does take quite a bit of nervous energy for me to help N children get ready to run, and then run with every one of them and cheer them on. Although I have been setting PRs in 5 Ks and 10Ks in other races, my times have been getting progressively worse in this one. I have been getting frustrated, but this year decided to take it in stride. I'll make sure the kids have good races, and then see what's left for my own. Did a bit of a warmup, then it was time for Joseph's race. He walked 100 meters in 1:05 taking 5th place in the boys 0-2 division. Joseph turns 2 in January. Then Julia (4) ran 400 meters winning 3-4 girls division in 2:02, and beating all the boys as well. She and I had this conversation several times in the last two months: "Julia, what are you going to do on Thanksgiving?" "Run fast and get the turkey!". "what happens if you do not train?" "Another girl gets the turkey!". "What happens if you get tired and slow down?" "Another girl gets the turkey!" "What happens if you start crying?" "Another girl gets the turkey!" I was pleased to see how the physical and mental preparation bore fruit. Benjamin and Jenny's 800 m race followed. Since they were in the same race, I had to choose who to pace. It was a tough call. I figured Benjamin would need some extra help as he was racing in the 7-8 division, and he is 7, which means he'd be racing older kids. I instructed Benjamin earlier to start out fast to get out the crowd. He overdid it a bit - 19 seconds in the first 100. It took me a while to maneuver out of the crowd of little kids and catch up to him. I told him to ease off a bit. 44 at 200. Then the lactic bear jumped on him. 53 for the next 200 (1:38 at the turnaround), followed by 56. However, slowing down to 56 allowed him to recover. With 200 to he was ready to kick. 23 on the next 100, followed by 21 on the last. He gave it all he had and outkicked two 8 year old boys, which quite remarkable. It is not unusual for a smaller kid with more endurance to beat a bigger one. But it is nearly impossible for a smaller one to outkick the bigger unless the bigger gives up. Both kids fought it as hard as they could. Benjamin's push on the last 200 got him 4th place in his division and a PR of 3:18. In the meantime, Jenny won her division with 3:51. Then I paced Abby, our friends' daughter in the mile. She ran 7:57, a PR by 38 seconds. Finally done with kids races, now my own. Given the recent sickness, and the known difficulty of racing after kids races, I had two goals - break 22 minutes, and win a turkey by either making top 5 or winning the age division. At the start, it looked like it could take breaking 20:00 just to make top 5 - there was a huge crown of college runners from all over the state that came to visit family for Thanksgiving plus Josh McAdams. However, winning the age division with 22:00 was quite realistic - being 33 I am in a rather non-competitive age division. Most college runners by that age have lost their edge. I decided to approach the race with a caution attitude, and be thankful for every quarter at 5:30 pace or faster. The college crowd led by Josh McAdams. I ended up a bit behind from the start, and then started working my way through the pack until I found a couple of guys to run with. We hit the first mile in 5:18. HR climbed to 161. Afterwards, I was able to follow Hawk's quarter marks on the road. The pace dropped significantly. There was a headwind, but it dropped way too much, so much that I started feeling very comfortable. Next quarter in 1:25. Picked up a bit to 1:22. Then 1:27. This was enough for me. I broke away from the pack and hit the next one in 1:21, 5:35 for the mile, 10:53 at 2 miles. HR hit 169. Tried to hold 5:30 pace. Next mile in 5:32. HR down to 166. Caught two bandits at 3 miles, this race always has a lot of them. Hawk does not mind as long as they do not cross the finish line. One of them was going only 3 miles. The other was going all the way. I tried to encourage him to go faster by tucking in behind really close, but that did not work - he did not have much aerobic energy left. So I had to break the wind for him, or get a slower time. Since he was a bandit, the faster time at this point was more important than beating him. Tried to push it, hard to shift gears into a headwind. The next three quarters 1:24, 1:23, 1:23. Turned on the last quarter, now tailwind. Was able to kick, ran the last quarter in 1:14, 5:24 for the last mile. The bandit, being apparently a college runner, had lots of anaerobic juice left and pulled away from me on the last 200 as if I were standing. My last 200 was 36 seconds. HR maxed out at 172. My finish time was 21:49 on my watch, 21:50 officially. 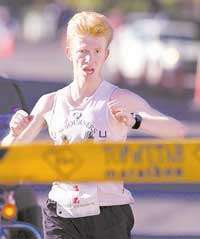 Josh McAdams won in 19:19. Full race results are available here. Ran back to meet Sarah. Met her at around 3.2. She finished in 36:52, 91st out of about 270 women. Not bad at all for having had a baby 4 months ago. Cooled down with Ted. At the awards ceremony Joseph got a turkey in a raffle. So we ended up with 4 turkeys. The performance in the race indicates I have gotten healthier since Monday. It is interesting that HR locks in at 166, and I feel like I cannot go faster after a surge that brought it up to 169. It might have something to do with the lack of anaerobic training recently. But I think it is more than that. It provides a clue to my dilemma of why I can do 5:00 - 5:10 - 5:20, but not 5:20-5:10-5:00 in a 5 K. HR stays fairly low on the first mile even if I am running 5:00 - it would take in about 0.5 to hit 160, then it probably hits 165 at 0.75, and then reaches 170 at the mile. The race showed that I can get up to 170 and hold it for a minute or two, but then it is too much, I drop back to 166. So if I want to run the first mile in 5:00 I need to hold 170 for maybe a minute, while if I want to run the last one in 5:00 off regular race pace, I need to hold 170 for the entire mile. If I am right, it logically follows that to improve my 5 K I need to create a workout that would hold my HR at 170 for the maximum possible amount of time. I think I'll give it a try sometime in March. Provo Canyon. Ran 6 miles with Ted. Then saw three runners, and decided to join them. Their names were Peter and Tim Wright, twin brothers, the other runner's name was Nathan. Of all things, it turned out that Nathan was fluent in Russian, Tim was fluent in Serbo-Croatian, and Peter was fluent in Norwegian. All three learned their languages while serving an LDS mission. Now this happens only in Utah, more particularly in the Utah County. Where else in the world would you be able to randomly approach three runners on a cold morning in a canyon and find this degree of language fluency? Here in Provo you can go to the store, and if you see a young non-Latino man without an earing, tattoo, extreme hairstyle, or other similar marks, you can start speaking to him in Spanish, and there is about a 30-40% chance that you will find him fluent. For Russian, it is somewhere around 10%. There is about a 70% chance that he will be fluent in some foreign language. And we are talking about a very decent level of fluency. Your average former Russian-speaking missionary sounds like an Estonian that did well in his Russian classes. The better ones sound essentially native. I was having so much fun chatting with my newly found friends about the intricacies of learning a language and other things that I decided to go a little longer than I planned. We ran past the Bridal Veil Falls where the search and rescue operation for the three stranded climbers was in progress. I ended up with a total of 15.75 miles on this run in 2:01:33. A very healthy base-building run. Ran some more with the kids in the afternoon, total of 17.5 for the day. Ran 10 miles with Steve Ashbaker on the Draper trail in the morning in 1:03:45. Rolling hills constantly on that trail. Did some tempo pickups in the middle at about 5:45-6:00 pace. HR was 154 at 5:45. Ran with the kids in the evening.